Protect your most valuable investment, your home! Why is it that when we buy a house, our most valuable investment, we’re left on our own to figure it out? Where’s the maintenance schedule and where is our instruction book? In the first hour of this workshop, we guide you through a maintenance schedule for your home. Come with questions because the second hour is open to Q&A from our students. Seating is limited and advanced registration is required. Please select from the available workshops below. Sorry, this class is currently full. 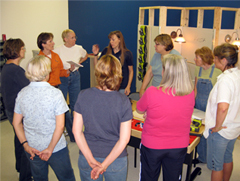 We'll keep you informed as we add new workshops and offer special promotions. We post updates, photos and videos. We also invite our fans to participate in discussions about topics that interest you! We supplement our workshop handouts with reminders, creative ideas and tips and tricks!